Defender Jordan Turnbull admitted it was a relief to finally record his first clean sheet since signing for the Cobblers with Saturday’s goalless draw against Oxford United. Northampton in general have struggled to stop opposing teams from scoring this season with their most recent clean sheet, prior to Saturday, coming three months ago at home to Bury, which also ended goalless. They’ve kept just five in the league all season but Turnbull, who had another solid game against Oxford, hopes his blossoming partnership with captain Ash Taylor will ease the burden on goalkeeper Richard O’Donnell for the rest of the campaign. “It’s the first clean sheet since I’ve been here and it’s definitely something I’ve been looking forward to getting,” he said. “We’ve got a new-look team and there are a lot of new players and maybe we are starting to gel a lot better now because we’ve had some time to work with each other. Our away form has been much better than our home form which is something that might seem a bit strange but we work well away from home; we’re strong and solid and can break on the counter. The 23-year-old played at left-back in the 2-1 win over Bradford City and the 1-1 draw at Blackburn Rovers but centre-back is his preferred position and, barring injury, he looks to be Jimmy Floyd Hasselbaink’s first-choice partner for Taylor. “I enjoy playing next to Ash,” he added. “Everyone knows what he’s about. He’s a big, physical character and he’s confident and loud on the pitch. Despite losing just two of their last nine games, Town remain embroiled in a relegation scrap at the bottom of League One. They currently sit 19th, one point ahead of Fleetwood and two above Oldham Athletic, but both of those teams have at least one game in hand. Nevertheless, Turnbull is in confident mood, adding: “We’re all confident we can avoid relegation, that’s the main aim. We want to get safe as early as possible. 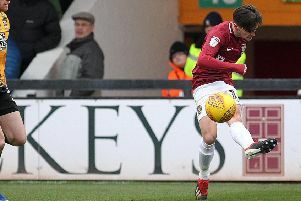 The Cobblers head to the seaside and Blackpool this weekend and they might be glad to get away from Sixfields given their recent form on the road. They’re unbeaten in four away games, beating Bradford City and AFC Wimbledon and also drawing with high-flying duo Blackburn Rovers and Scunthorpe United. “Our away form has been much better than our home form which is something that might seem a bit strange but we work well away from home; we’re strong and solid and can break on the counter,” added Turnbull. “We’ve managed to score a few goals on the road and hopefully we can continue that at the weekend and the strikers are back firing again.